Many people in Faversham and Mid Kent rely on trains to get to work and for leisure; in term time, children use the train to get to and from school. Access by rail is important for local businesses and tourism. We need fast, frequent, reliable and good value train services. Across the country, more people travel by train now than at any time since the 1920s. Choosing trains over other forms of transport has many benefits, but the increase in passengers puts strains on the system. The Conservative Manifesto pledged the biggest investment in rail since Victorian times and that pledge is being met nationally with £38 billion being spent on upgrades. My job is to make sure the constituency gets a fair share of the Government’s investment in rail, and to hold to account the organisations people rely on for rail services: Southeastern, the current franchise holder, and Network Rail, which maintains track and infrastructure. Southeastern runs services on three routes in Faversham and Mid Kent: the Maidstone East line serving Bearsted, Hollingbourne, Harrietsham and Lenham; the Ashford line serving Headcorn; the Chatham/North Kent line serving Faversham and Selling, this line includes a St Pancras service via the international HS1 route. Since becoming the MP for Faversham and Mid Kent I have replied to hundreds of emails about local rail services, often from people frustrated by them. Overall, the main concerns are delays and overcrowding, poor communication by Southeastern and Network Rail about problems, reductions in services to the City, longer journey times following the introduction of HS1 and the level of fares. In Faversham there are also unreliable lifts and a grotty subway under the tracks. The lifts have not worked properly since soon after they were installed. Southeastern have acknowledged they need to be replaced. Late trains are enormously disruptive for work and home life, and though we all understand there will be occasional crises which delay services, such events should be few and far between. Work to renew the south east rail franchise is due to start soon. I see this as a major opportunity to see improved services for the constituency. The average journey from Bearsted to London took 1 hour 13 minutes in May 2015 and the best scheduled 'high speed' journey between Faversham and St Pancras was 1 hour 4 minutes. Meanwhile, it takes only 37 minutes to go from Ashford to St Pancras. Other areas are benefiting from faster services; I don't want to see Faversham and Mid Kent left behind. I encourage you to take my rail survey to make sure your voice is heard. Also, peak time services from London to Bearsted were reduced from eight per hour to six between 2014 and 2015 and there were reductions in the number of trains running from Faversham to Victoria and the City when HS1 arrived. This means inconvenient journeys for some passengers and longer car journeys to better served stations, like Headcorn, for others. In addition, it seems Bearsted passengers pay more per mile than passengers from other Kent stations. I’m supporting a long-running campaign for fairer fares from Bearsted, led by the Bearsted Commuter Group. Though season tickets are expensive, they offer good value to commuters compared to purchasing individual tickets. But, buying a season ticket rarely adds-up for someone working part-time, forcing part-time workers to pay full price even though they may be less regular rail users. This can hit parents who are working part-time around childcare commitments, often with tight budgets. Lastly, but very importantly, we must bear in mind the new housing planned for many parts of the constituency; it is vital that infrastructure keeps pace with development and that includes rail. The Rail Minister Paul Maynard has listened to your calls for faster more reliable trains. Commuters have been seriously let down by local rail services over the past few years. Although there have been some improvements in performance, we are still a long way off reliable rush hour trains which are good value for money. 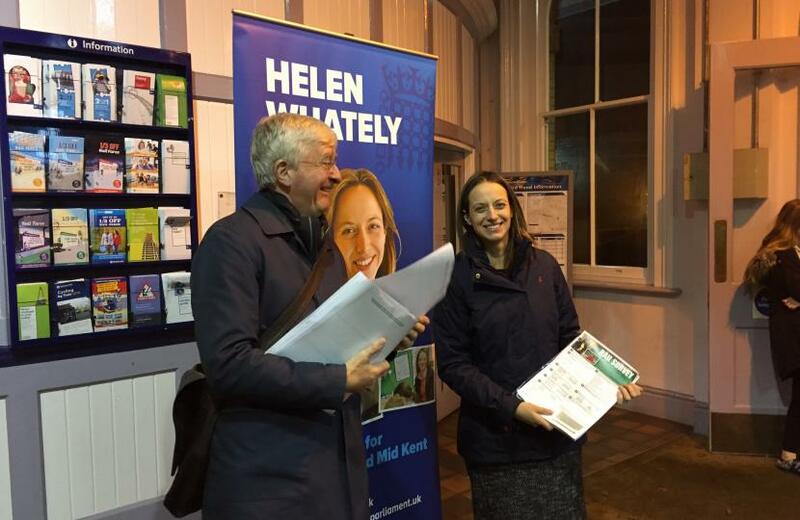 In December I launched a rail survey asking passengers to tell me what they want ahead of the Government's decision on which company will run the train network in the south east for five years from December 2018. I was pleased to see the announcement from the Rail Delivery Group that 'radical changes' to rail ticket prices will be introduced to offer passengers the best value fares. I often hear from commuters about problems with train services, and I travel frequently by rail myself. I know services are not good enough. There are changes afoot in the next couple of years and I want us to benefit from them. There were terrible delays on trains between Faversham and London today, with some people waiting up to an hour and a half for over-crowded trains. If your train is delayed by 15 minutes you will be able to claim back 25% of your fare, under a new compensation scheme set to be introduced on Southeastern trains. Compensation for delays over 30 minutes is unchanged. Performance on Southeastern trains is woeful. So I welcome proposals to split the franchise, providing it improves service for passengers.